Between the 7th July and 30th December 2017, 80 Contemporary British Paintings will go on display in 4 Chinese art museums for the very first time. Between the 7th July and 30th December 2017, 80 works of art drawn from the Priseman Seabrook Collection of 21st century British Painting will go on display in 4 Chinese art museums for the very first time. The host institutions are the Yantai Art Museum, Artall Gallery, Nanjing, Jiangsu Art Gallery, Nanjing and the Tianjin Academy of Fine Art, Tianjin. Along with the exhibition, six of the exhibiting artists will go out to talk on the subject of British painting in light of the digital revolution and explore why the hand-made work of art is more relevant today than it has ever been, connecting directly as it does with the profound human need to touch, feel and mediate emotion. Because painting’s rising relevance in the 21st century is beautifully aligned with the resurgent growth of interest in vinyl records, knitting, film photography and unplugged music. In this new exhibition, we will see how painting exhibits a universal desire to connect to the real in ways which enrich us all. So why is painting from the United Kingdom relevant to a Chinese audience? When we look historically we see how Britain has nurtured some of the world’s greatest painters, from Holbein in the 16th century to Constable and Joseph Wright of Derby in the 18th, Turner and Atkinson Grimshaw in the 19th and Freud, R. B. Kitaj, Rego and Francis Bacon in 20th century. This level of excellence in the art of painting in the British Isles has continued to evolve into the 21st with a new generation of artists who have made the production of significant painting their life’s work. In 2014 I came to realise that many of this new wave of British painters had yet to be collected with same the geographical and chronological focus of their predecessors and foreign contemporaries. So, with the help of my wife I began the process of bringing together a body of work by artists which followed the very simple criteria of being painting produced after the year 2000 within the British Isles. The painters we began collecting included European Sovereign Painters Prize winner Susan Gunn, John Moores Prize winner Nicholas Middleton, 54th Venice Biennale exhibitor Marguerite Horner, East London Painting Prize Winner Nathan Eastwood, NPG Portrait Award Winner Paula MacArthur, Griffin Art Prize exhibitor Matthew Krishanu, Birtles Prize Winner Simon Burton and Mary Webb who received a solo show at the Sainsbury Centre for Visual Arts in 2011 amongst many others. Creating this focus has enabled us to uncover a number of significant themes which at first were hard to discern. In it we can see that painting is now expressing itself along the same lines as the slow food movement, meditation and unplugged music. Within the era of the digital revolution it offers a direct and contemplative connection with the hand-made, with real objects which mediate our emotional makeup. We see this most clearly in the fact that the paintings within the collection display no clear and consistent group narrative or movement other than being broadly realist, abstract and surrealist, and are instead an assembly of highly individualistic interpretations which offer visual interactions with the physical world. One interesting thing has however remained consistent. When we look to the past we notice how many of the greatest painters who practiced in the UK were born abroad, including Holbein, Freud and Auerbach who were born in Germany, Bacon who was from Ireland, Kitaj the USA and Rego who was born in Portugal. Indeed it is this international influence which has probably helped create such a strong and vibrant tradition in the genre in Britain and which is most reflective of our civilization as a broadly international and multi-cultural society. In the 21st century we see this strand of internationalism continuing in British painting and being signified in the collection by Monica Metsers who was born in New Zealand, Claudia Böse and Silvie Jacobi who were born in Germany, Rhonda Whithead from Australia, Laura Leahy and Julie Umerle who are from the USA, Alison Pilkington who is from Ireland and Lee Maelzer who was born in London. 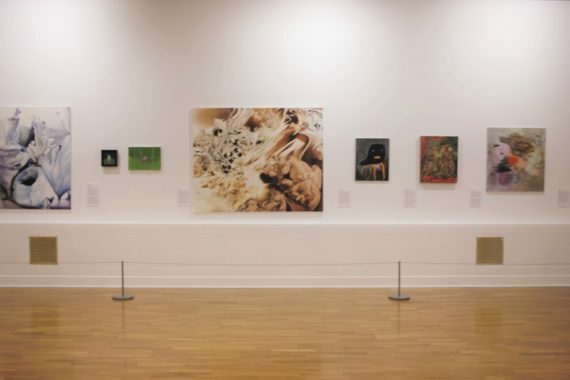 This role call perhaps highlights the biggest change we begin to notice in British painting, and it is the shift from the predominantly male dominance the genre experienced up to the end of the 20th century to a significant ascendancy by female practitioners. Indeed, of the 75 painters so far represented in the collection 44 are women, placing male artists in the minority. Something else I wish us to consider in looking at the works themselves, is that just as there has been a major shift in fine art practice from male to female dominance, there is now also a shift occurring in the way painting is being perceived as an art form in the light of the digital age. Within the field the multitude of “isms” which previously made up the landscape of 20th century art have instead been replaced by the one big “ism” of the 21st century, “individualism”. In this context we may begin to think of and experience paintings not as works of art produced from the hands of specifically female or male artists, but from a group of individuals; unique, talented and united by the common bonds of time and place and a desire to connect to the elusive experience of what it is to be human. In exhibiting their work, we create international dialogue and debate between ourselves and other cultures. This is not the art of globalisation, but is instead an art of internationalism, which defines itself as the free and open exchange of ideas between all peoples for the common good. Contemporary Masters from Britain draws 80 works from the Priseman Seabrook Collection of 21st Century British Painting which is housed in North Essex. It is the only art collection in the United Kingdom dedicated to painting produced in Britain after the year 2000. Read more about the collection here.